Ban Kiw Lae Noi Community The village is the birthplace of carvings. And most carved. 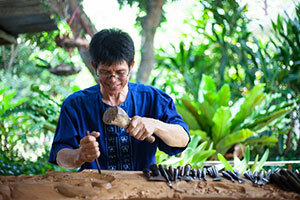 The craftsman's carvings in the village were recruited into OTOP Thailand. In the look of an elephant And carved Ramayana pattern. Mostly sent to Ban Thawai. In 2547 has been selected the best OTOP Thailand. Get three stars as follows. Of Wood Products Handicraft Cooperative Ltd.
Travel The route from Chiang Mai city is 2 routes from the road along the irrigation canal from Chiang Mai town. Through the district of Hang Dong. And the central area of Tambon Nam Bo Luang Sub-district San Pa Tong District To Ban Kiew Lar Noi, which is the center of the Tambon administrative organization. Health Center OTOP Show and Sale OTOP products. Another route is the main route. Chiang Mai - Hod Road from Highway 108 at the intersection of the airport or Central Airport intersection. Through the district of Hang Dong about 10 km to the canal irrigation canal San Pa Tong. Turn right along the canal irrigation. Pass through the area of Yu Wa about 6 km.